Last month, The Guardian published a series of articles on populism, which were accompanied by much hype from the newspaper’s social media accounts. They started the series with the front page splash, ‘Revealed: One in Four Europeans Vote Populist’. This series included articles discussing the ‘rise of populism over the last 20 years’ and an analysis of how many times the word had been used in The Guardian in various years. The two items that attracted the most controversy, and are most interesting in an ideological sense, were the hilarious ‘How Populist Are You?’ quiz and the horrifying interview with Hillary Clinton. These are worthy of further examination. Firstly, the quiz. The set-up is very much along the lines of that Political Compass quiz that everyone has subjected their friends to. 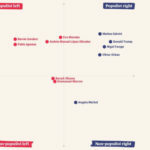 However, while that quiz labels their two axes as left-right (an economic analysis) and libertarian-authoritarian (a social analysis), The Guardian equivalent instead opts for a left-right horizontal axis and a non-populist-populist vertical axis. The examples they give are illuminating. 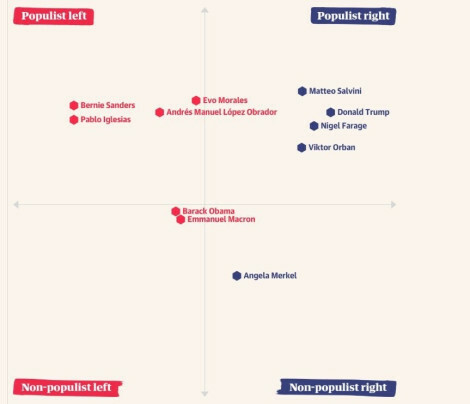 As seen in the diagram, Bernie Sanders is apparently ‘more populist’ than Nigel Farage, Donald Trump and Viktor Orban, whatever that means. Considering that populism is presented throughout the series as a negative and a threat, does this imply that Sanders is somehow ‘worse’ than Trump, Farage and Orban? That is an *interesting* analysis coming from a nominally centre-left newspaper. Although Sanders is presented, and at times presents himself, as a socialist radical, he in reality would be comfortably at home in most European social democratic parties of the 20th century. 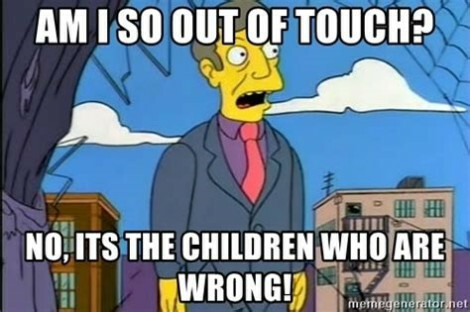 So what is it about an agenda of nationalised healthcare, free college and a higher minimum wage that is more threatening than hard-right anti-immigration policies and entho-nationalism? We are not given an answer. It is also interesting that The Guardian, a predominantly UK-based publication, omits British political leaders from this grid. Is this, as Ronan Burtenshaw suggested, meant to imply that Jeremy Corbyn is so extreme as to not even be on the grid? Or is it an attempt to slightly obscure the troubling conclusions of this analysis from readers who would be mostly familiar with politicians from the main British parties? To see what exactly these conclusions are, observe the political leaders in the ‘non-populist’ section; Barack Obama, Emmanuel Macron and Angela Merkel. Aside from wondering how the union-busting Macron makes it onto the left side of the grid at all, the main thing to notice is how close together on the grid these figures are compared to those on the populist half. Given the positioning (and actual politics of) both Obama and Macron, does it suggest that there can be no truly ‘non-populist’ left wing figure? Furthermore, what message is to be taken from the fact that the only apparently ‘non-populist’ figures coalesce around the political centre? The fact that those who conducted this analysis can only imagine ‘non-populist’ figures as coming from the technocratic centre should have raised questions about the entire framework that was used. What this does seem to tell us is that ‘populism’ in this context simply means anything that the neoliberal centre considers to be bad. This raises a greater question again – what’s the point of all this? Devoting an entire week of coverage to tell us that the neoliberal ruling order has lost legitimacy with large swathes of the populace seems a bit of a waste of time. That should be rather obvious by now. It also elides the fact that establishment politicians have been no strangers to populist rhetoric over the preceding decades. While ultimately facile, Barack Obama’s 2008 campaign slogans of ‘Change’ and ‘Yes We Can’ are obvious examples of populism – characterising his campaign as a restoration of national dignity after the ignominy of the Bush years. It doesn’t matter that it was vapid. Similarly, Macron in 2017 sought to distance himself from the traditional centre-left and centre-right and set up his own En Marche insurgent party in his bid to become French president. It doesn’t matter that most of his support came from anti-Le Pen voters rather than enthusiasm for his odd blend of technocracy and egomania – he ran a marketing executive’s idea of a populist campaign. Even if we look to the UK, what is more populist than seeking a referendum of the people in order to subvert the machinations of elected politicians? The People’s Vote campaign may be, like Macron’s, an ersatz imitation of a grassroots movement but it is populist nonetheless. There is a litany of other examples from pre-2016 as well. Think of Labour’s ‘Controls on Immigration’ mug or George Osbourne’s ‘Pints and Pasties’ budget – an aristocrat’s desperate attempt to identify with an imagined working class. Given that one of the purposes of this entire exercise seemed to be conflating democratic socialists with the entho-nationalist right, it isn’t too surprising that The Guardian would go back to the dead centre for solutions. They interviewed Tony Blair, Matteo Renzi and Hillary Clinton on how to deal with the problem of populism. If those names alone don’t tell us how much of a mess the centre is in, the outrageous Clinton interview sets alarm bells ringing. The former Presidential candidate’s solution was that “Europe needs to get a handle on migration because that is what lit the flame.” This statement was rightly condemned far and wide – let alone her ignoring the horrifying consequences of the European border regime as is, Clinton pays no heed to declining economic fortunes for larger swathes of the population following the economic crisis and the decade of austerity that followed. This fundamental lack of solidarity and desire to capitulate to the far right should be absolutely disqualifying for anyone calling themselves progressive and should put an end to any notion of her running in the Democratic primaries for 2020 (as an aside, it is interesting to note the radio silence of the merry band of Northern Ireland Clinton worshippers even as their Queen made international headlines.) But in the past few days, The Financial Times have an run editorial arguing that Mexican social democrat Lopez Obrador is a “bigger threat to liberal democracy” than the open fascist Bolsonaro in Brazil. The populism frame of analysis as employed by The Guardian, while rather useless on the surface, is illuminating in how it seeks to conflate economic redistribution and investment in social services with ramped up border violence and open racism as a singular, conjoined threat to the political order. It also gives away deep-seated reservations about democracy among centrist elites, as well as an absolute lack of self-reflection or responsibility. Nonsense as it is, it is interesting to observe in real time how the centre seeks to process its devastating defeats in the last few years. But as it seeks now it reassert itself, it is a serious concern that it will have learned no lessons from this and proceed to do as it has always done – punch hard to the left and concede ground to the far right. Reposted with kind permission of The Last Round. I read this article and found it very interesting, thought it might be something for you. 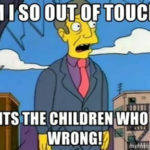 The article is called The Problem with ‘Populism’ and is located at http://criticallegalthinking.com/2018/12/05/the-problem-with-populism/. Excellent commentary on the Guardian series! I’m just wondering why you’re so concerned that the (neo)liberal centre ‘will have learned no lessons’ from the rise of the (more) authoritarian right? Why do we keep entertaining the hope that somehow the centre will U-turn on their key tenets and save us — why not focus also on the scary possibility that parts of the left have learned no lessons since 2007/08? What modest vision have ‘we’ got to offer to average Guardian readers, and what are the organisations/platforms/… that can carry such a vision forward? I’m not at all saying it’s too late. But let’s have more open discussions about the limits of populist theory and practice, the reassertion of the centre, circular ‘closed borders vs open borders’ arguments, the possibilities of transnational organising, etc.